The hit book The 150 Healthiest Foods on Earth by Jonny Bowden is a great resource, because it highlights the health benefits of many everyday foods. This is not a book that sends you off in search of unusual and hard to find stuff — it lists basic, readily available items. Eating healthy is a challenge for busy people, so here’s a list of 12 “superfoods” to keep in mind when preparing meals and snacks. Beans: They’re small in size, but big on fiber and iron. Darker-colored beans, such as black and kidney, have an even higher concentration of healthy stuff. 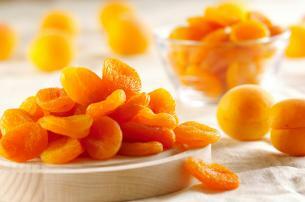 Apricots:The oft-forgotten apricot is great source of Vitamin A and other nutrients. Dried apricots are even more nutritious, and portable, than fresh ones. Prunes — hey, don’t laugh — are also terrific. Berries: Blueberries in particular, but also cranberries, raspberries and blackberries are highly recommended for healthy aging. Said to help maintain short-term memory, blueberries contain high levels of antioxidants. Broccoli: It’s not hard to eat broccoli if you sauté it in a bit of olive oil and garlic. Deep-green vegetables like collard greens, kale and asparagus have abundant nutrients. Bok choy (Chinese cabbage) is also packed with nutrients that are said to guard against certain cancers. Cacao: Didn’t expect to see chocolate on a super food list, right? Well, buying organic chocolate (found in most health food stores) with high levels of cacao can do a body good. It may not be the tastiest thing to eat straight, but mix a bit of 100 per cent organic cacao powder into a morning smoothie or coffee, or buy chocolate bars that are at least 75 per cent cacao. Note: Snickers bars are not a healthy substitute. Peanut Butter: The food that kids love is, in fact, healthy for you. Nuts are packed with omega-3 fatty acids, which can help fight heart disease. Almonds, in particular, are known for lowering cholesterol. Turkey: Thanksgiving and Christmas are long gone, but it’s always a good time to make lean, protein-rich turkey. You can cook a small breast with a side of cranberries, or substitute ground turkey in recipes that call for ground beef. Unfortunately, turkey lunch meat doesn’t make the cut, because it’s typically high in sodium. Cinnamon: Believe it or not, this spice is considered to be one of the healthiest foods in the world. And, no, it doesn’t count if it’s glued to the top of a sticky bun! Simply dust it on your oatmeal, your morning coffee, or even on a piece of fruit. Studies suggest that it can lower cholesterol and help control blood sugar (diabetics take note!). – Update: Kim and Gary (see comments below) have brought to our attention that the American Diabetes Association posted a study just last month saying that cinnamon DOES NOT have any effect on your blood sugar levels. Thanks, Kim and Gary! Pomegranate juice: This antioxidant-rich juice has been shown to help fight heart disease and lower cholesterol. Drink a small cup of pom juice daily, diluted with water if you find the taste too strong. You can also buy blends that contain apple or blueberry juice. Yogurt: Smoothie lovers, take a bow! You’re ahead of the game if you’re eating non-fat yogurt, because it’s good for intestinal health. Mix the plain stuff with some of the items on this list, including nuts, cinnamon or berries and you’re doubling up on healthy ingredients. Oats: Whole-grain goodies, such as oat bran breakfast cereal (like Cheerios), oatmeal and whole grain breads are on the list because they help lower your cholesterol and increase fiber intake. Avocado: Go ahead and whip up some avocado salsa, a great side dish. Guacamole is also good for you. Avocados are high-calorie, so you don’t want to go crazy eating them, but they are said to improve blood flow, which increases brain activity. Great piece on the 12 superfoods, I actually learned some ne w ones in reading it. I just wanted to let you know that Cinnamon has now been found to NOT effect your blood sugar or to help diabetics in any way. I am a diabetic and was taking cinnamon capsules and putting more into my coffee and tea, so I was a bit bummed. I just thought you would want to know. 2. Hydrogenated fats aren’t good for you. The Americian Diabetes Association posted a study in Jan ’08 that cinnamon DOES NOT help with sugar control. Article needs to be updated to reflect that. That’s a very concise list there I have heard of some substitute chocolate but, not that paticular one that is mentioned, never tried apricots. Also, regarding your cinnamon comment, what most people think is cinnamon in the US, those small, thightly rolled dark brown sticks, is actually the bark of a different tree, the Cassia tree. *True* cinnamon is much larger, lighter, and more delicate (thinner) and also much more expensive. It can be found in specialty storey, but I highly doubt that your local grocery store stocks it. The FDA decided a long time ago that Cassia bark could be sold and called ‘cinnamon’ in the US, so thank them for thinking you have been eating cinnamon when your whole life you haven’t been. #5 Cacao does not belong on this list. There is no way in hell caffeine is healthy for you – its a toxin and highly addictive. It will make your thoughts race, make you hyperactive, then fatigued, paranoid, quick to anger… and if you keep eating it, it will kill you. If you feed chocolate to dogs it will kill them. Not to mention its highly addictive… look up the wikipedia entry on “Drug Addiction”, and you’ll see caffeine listed. Or do a Youtube search for “psychetruth caffeine”. Worse, caffeine is refined out of cacao plantes when decafinating coffee, and pumped into high fructose loaded corn syrup soft drinks, and soft drinks are toxic as hell. Tell any nutritionist you drink a soft drink a day (or five, like I was) and look at the pained expression of horror that comes over their face; that should give you some idea. I love the list I was surprised that sprouts were not high on the list?! or flax seed meal? or smoked salmon? Which are two easy ad-on items which are so benificial for a healthful diet which I swear by ; sprouts, of all sorts alfalfa, mustard, broccoli etc live food and greens grown right in the kitchen that are easily obtainable and flax meal added to cereals and used often as an adjunct to breadcrumbs (on in place of) has a nutty flavor, high in oils and both items mentioned keep you as regular as a clock! I get the frozen wild (Maine) Blueberries a shy cup unsweetened yogurt (also shy cup) 1/3-1/2 cup flax meal, tablespoon honey, tablespoon tahini minced sunflower seeds and mix (thaw berries), this is one of my lunches. The other staple is smoked salmon with balsamic vinegar on the bed of sprouts. yum. The article reminds me that so often the food producers used tactics for the marketplace and welfare of the food product sold, not the welfare of the consumers of said foods, additives like hydrogenated oils, sugars, corn syrup, sulphurs etc, so if one looks @ what’s often touted as food is not truly fit for healthful living but a contributor to disease . Thank you for the great reminders to eat well, one’s health depends on it. Oat bran, is a superfood, yes. And believe it or not original Cheerios (not the frosted or fruity kind) is made with 100% oat bran, and makes a healthy breakfast with low-fat milk. I’m enjoying your opinions! There’s power in opinion! I’m glad to see that Avacado’s made the list… many people just don’t understand how nutritious they are for you. Another food that wasn’t mentioned is Goji Berries. They are like a superpacked BlueBerry.. Sketch you are so right about the Goji Berries. The problem is that they are not readily available in your average grocery stores, and they are pretty expensive around here. I like the list of foods and I am glad to see that avocado was on the list. Avocados are very nutritional. Also look at the benefits of tofu, high in protein, low in saturated fats, a good source of Vitamin E and may play a great role in preventing various types of cancer. Dried apricots are even better for you then fresh ones? I beg to differ. They may be more convenient to get or carry around, but they are also often loaded with sulphites, a cheap preservative which is very bad for your health. Almost any type of dried fruit, unless you are willing to pay a lot more for organically produced and processed versions, are loaded with sulphites. So I’d rather stick to fresh fruit, as the benefits of preserved fruit are far outweighed by the toxic stuff used in preserving. The truth is nothing is good for everybody.Every persons body and chemistry is different.Some of these “Healthy foods” could kill some people.Do what is right for you,and stop trusting these lists! I do see some missing links on the list and would like to ad another speaking a SUPER FOODS & of lowering /stabilizing glucose levels a level teaspoon of spirulina will do just that and and I did not find it in a book I noticed the affect to my sugars as consistently benificial yet un mentioned mode of doing just that. So Gary & Kim you may want to look at the papers on the site mentioned the cinnamon and certainly for the Spirulina which was news to me. The other thing to note is the quality of the cinnamon and potency and consistentancy of nutritional value could vary greatly. One could say that about spirulina as well. Thanks for the info on the spirulina, I will check that out now. As to what I used when I was using cinnamon on a daily basis was not cassia but true cinnamon, I ordered it from Penzy’s Spices. Your suggestions are small but very effective. I like your smart work and description. I would also want to introduce to you about The hit book The 150 Healthiest Foods on Eart by Jonny Bowden is a great resource, because it highlights the health benefits of many everyday foods. thanks for sharing this information this is quite informative. OK, Peanut Butter is terrible for you but give them a break it could of been just an error. If you opt for NATURAL PEANUT BUTTER then thats where the nutritional value comes from…..
Cacao DOES NOT contain caffeine, and has been proven to be pretty good for you, though I can’t remember the specifics. raw cacao is extremely high quality food. Totally different from highly processed, weakened industrial chocolate. Hi Everyone, Here are a few nutritional facts on raw cocoa and where to buy it. I have never tried it but from what I read, it does taste toatally different from the processed cocoa. It is of course important to note that peanut butter needs to be the oragnic variety, as opposed to the sugar laden brands. Choosy moms choose nature. Another great idea is just to simply put some peanuts in the blender…. homemade peanut butter. Omega-6, -9 fatty acid (oil) should be consumed at a minimum/avoided and offset by fatty acids high in omega-3. The goal is to consume the highest ratio of omega-3 to omega-6,-9. Peanut butter and oil is one of the worst providers of omega-6 with only a trace of omega-3. Even a peanut-promoter site doesn’t hide this bad news: http://www.peanut-institute.org/NutritionBasics.html For the same reason, corn, corn oil, corn products, safflower oil, soy and soy oil, canola oil, sunflower oil are to be minimized or avoided. Grain-fed meat and dairy, fed perversely on corn/soy and their oils, (cows evolved eating low-carb leaves, not calorie-dense seeds) are all high in omega-6,-9 and low/no omega-3. Grass-feed beef and dairy is acutally healthful, therapeutic. The foods you are listing are beneficial, but their effects are not being duly considered. Most of these foods are acidic in nature and will alter the alkalinity of the body. It should be noted that illness and disease thrives in acidic environments. is it true that a tablespoon of peanut butter before bed can keep your metabolism going while you sleep? Metabolism is a fundamental activity that is not amenable to significant manipulation, short term or long term. NOT a good food. Of all the legumes, peanuts are one that should be at the bottom the list, no matter how successful the peanut industry marketing is. What a yummy list of food! I adore avocados but so often am disappointed by them being not quite ripe! Perhaps I should move to a country where I could grow my own avocados? And chocolate – mmm I could live on a chocolate and avocado plantation! flaxseed and salmon? great for omega 3s. If you would like to have a more complete list you have to add stabilized rice bran. It is nutrient-dense, non-allergenic, and versitile in application. I suggest the soluble form if you’re going to drink it like a milk. If you are going to add it into a shake/smoothie, then go with the version with both soluble and insoluble fiber. I recently just started talking Kelp viatamins. Check ‘em out online! I like eating salmon or chicken for breakfast. Yes it sounds odd, but then I am energized for the whole day! Interestingly enough, I was just eating dried apricots when I saw the picture. I didn’t know they were so healthy, no added sugar needed, they’re sweet. Why are dried apricots so healthy? Here is the nutritional breakdown of apricots. We need to keep in mind that this list is of common, everyday foods. If you walk down the aile of Whole Foods, there are many unusual and very expensive foods (like gogi berries) that are higher up on the superfood list but certainly not readily availabe to most people. i like it, healthy post. Mmmm… love avocados! The great thing is that all these food taste good if prepared right! Great post, who woulda thought dried apricots are so healthy? I eat em all the time. Apricots and almonds are my favorite snack! Also, quinoa is really good for you and it’s becoming more common. It’s basically a healthier version of rice. I was amazed to see that berries can increase short term memory function, I never knew that before. Good to see that some protein made the list as well and that processed turkey was left off the list. As for the conspiracy that someone paid money to put this list together (I saw some of that in the comments) I don’t believe it. Getting into a more healthy life style takes work and each person is going to have different suggestions on what you should eat. Look at all the different diet styles out there. Thanks for the tips. I never really paid too much attention to what all these great fruits and veggies can do for me. I will use what I have read here and incorporate them into my everyday life. It will be easy enough to not have to worry about adding any extra time to a busy day that can’t spare the time. Thank you for this list. I’m sending this to our members. Good food is an important way to combat depression. Your blog is very helpful. Can Noni juice and Rooi Boss tea be included in the list of Superfoods ? I am not familiar with either of those juices, but I’ll bet they are on someone’s list of super foods! Oooh! I eat 10 of these already. Honey should definitely be on the list too. Just wanted to mention that the cinnamon study you linked to was a meta analysis of studies. All studies used cinnamomum cassia which is NOT the real cinnamon. Cinnamomum verum or zeylanicum is the cinnamon you want to take. So if you you use an entirely different species of plant for your study, how can you expect it to work? Fresh apricots are the best! So much great fruit at the supermarket at the moment! Making a fresh fruit salad has never been so colourful! Really? This post totally made my day, I don’t know how I missed some of these foods and didn’t eat them since I was diagnosed… I will have a very interesting dinner tonight – thanks! I have always had a problem cutting out carbs, i love my cakes and biscuits too much. These super-foods are often looked away since they common people aren’t educated about their nutritional benefits. Proper nutrition is vital to healthy living. Eat super-foods in conjunction with exercise and work-outs, and you are guaranteed to lose body fat quite fast. Some new high fibre chocolate bar has been introduced in the UK. It’s advertised on TV by a well known actress. Guess what the main ingredients is – it’s OATS! OK I think it’s got rice in too, as well as a little almond and chocolate, but it’s really quite nice! Having 20% of your daily fibre allowance in one snack bar strikes me as a great idea. The fact that it’s edible makes me even more suprised! I have a copy of The 150 Healthiest Foods on Earth and it is a great resource and reminder that there are tons of different healthy foods that we can eat and enjoy and still be healthy. A good list, ill be sure to pass it on.